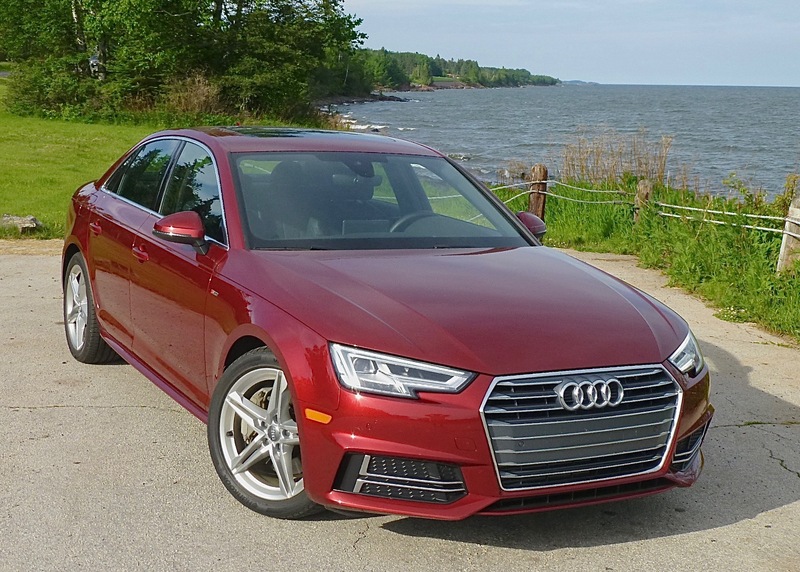 All grown up in its fifth generation, the 2018 Audi A4 is now an entry-luxury sedan. The first Audi A4 was built back in 1994 and introduced to the U.S. as a 1995 model. That was 23 years ago, and the car remains near and dear to my heart because that also was the year I was invited to join the North American Car of the Year jury. 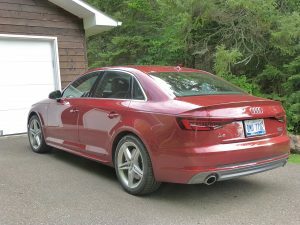 Rookie or not, I was fully confident in voting for the all-new Audi A4 because it met and exceeded all the criteria for being new, uniquely styled, for having high technology, and for being a superb car to drive. Audi had built great cars in Ingolstadt, Germany, for many years before that, but the A4 was a breakthrough as a moderately priced and moderately sized sedan, combining the luxury of the larger Audi autobahn cruisers and the fuel-efficiency so important to buyers world wide. Audi started out racing cars as Auto Union, which brought several companies together to compete with Mercedes and, later, BMW. For a number of years, and through four generations of improved technology, the A4 was one of the best bargains in the automotive world, available starting on the bargain side of $30,000. It was always a well-balanced, safe car, and it had the quattro system of all-wheel drive that Audi had devised and was already acclaimed worldwide. The front-wheel-drive A4 was a good deal, but the quattro model was only a $1,500 hit on the sticker. Wise consumers learned early that for $1,500, you not only gained all-wheel drive, but when you traded it in five years later, it was worth about $3,000 more with quattro. The quattro concept was based on performance. When going around a tight curve the outside two wheels have to turn farther than the inside, so Audi’s quattro — lower-case letters, please — provided more torque to the outside wheels in curves. While helping speed and roadholding in racing curves, the quattro system provided improved safety and control on highways and streets in all weather conditions, as an exponent. A lot of years have passed since 1995, and the number of fantastic cars has proliferated beyond the scope of what any of us foresaw back then. 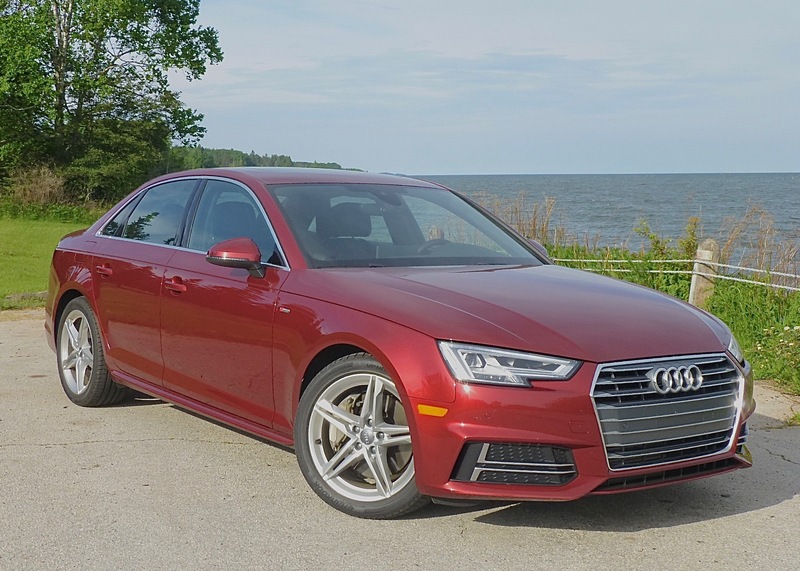 But it all came back to me recently when I had a chance to spend a week with a 2018 Audi A4 quattro, with a manual 6-speed transmission. A little longer, a lot more stylish and luxurious, the Audi A4 stands out. The car, now in its fifth generation, was dark red, called Matador Red metallic, and its understated luxury radiated whenever or wherever you parked it or drove it. Driving the car is a real treat, continuing a trait common to all Audis. The A4 has grown, or maybe matured is the best word, because it’s no longer the company’s efficiently stubby entry-level sedan, a role now filled by the very neat A3, allowing the A4 to age gracefully, retaining its sporty demeanor as it has grown into an “entry-luxury” car — a downsized version of the higher end A5, A6, A7 and A8 models. Climbing aboard, you are taken with the feel of security and luxury, from the leather seats and soft-touch dashboard and finely fitted seams everywhere. The supportive bucket seats amplify that feeling, all before you’ve even started playing with the instrumentation, which I find the most impressive of any manufacturer in the world. More on that later. The sticker delivered a bit of shock to my system. The A4 quattro listed for $40,500, which wasn’t bad, but as tested the car stood at $51,650. The high-tech stuff that all compiled on board as options can justify even that price, but it is a stretch upward from entry-level. Under the hood, the tried and true 2.0-liter 4-cylinder engine is turbocharged to deliver 252 horsepower and 273 foot-pounds of torque. 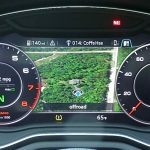 The 6-speed stick is a treat, especially with the quattro system’s ability to cling to the roadway when you drive aggressively around curves. 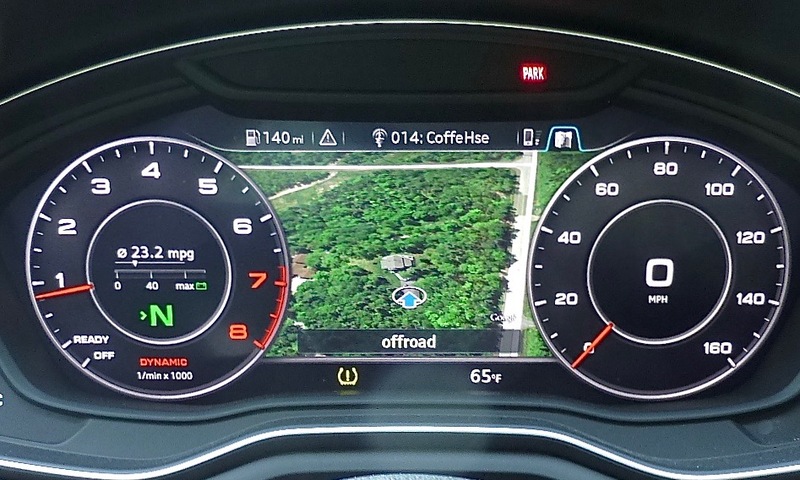 The 2018 A4 Sport quattro has a personal cockpit style and dashreplicated nav screen. 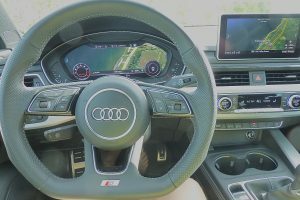 It also comes with start-stop to save you some gas at stoplights, leather seats, a power panoramic sunroof, and all the safety stuff, such as multiple airbags, Audi’s antilock brakes with accompanying electronic brake-force assist and the ability to prevent low-speed collisions in city driving. Full stabilization control also joins the standard equipment list. The Premium Plus package adds 18-inch styled wheels, a Bang & Olufsen sound system with 3D sound, a built-in alarm with motion detector, LED headlights (to go with the standard LED taillights), and the Navigation and Telematics package with Audi’s unique navigation system for the virtual cockpit, boost the price by over $6,000. And the Sport Plus package is worth another $3,400, with dynamic steering, sport seats and adaptive sport suspension, plus the S-Line interior trim to set your car apart from other A4s. While the driving is what leaves the best impression, there are some surprises there, too. The coordination between the impressive turbo power, the transmission, and the direct fuel-injection feeds the computer and allows tremendous flexibility in performance. You can take off as hard as you want, and even with a stick, you can enjoy shifting a lot or relax and shift only a little. The new A4 price reflects its new stature, technology, and style. If you approach an intersection in, say, fourth gear, as you decelerate and see there’s nothing coming, you can downshift and get more revs immediately, or simply step on the gas and let the computer pull out a bit more torque for a smooth and easy rise from crawl speed. Also, more than once I got onto the freeway, shifting up to fourth gear, and then, hearing no complaints from the engine, forgetting to go up to fifth or sixth because it cruised so easily at 70 that I forgot I was only in fourth. Even with a few of those brain-fades, we got over 30 miles per gallon, and a couple times reached the EPA highway estimate of 33. If you chose the front-wheel-drive A4, you might get more gas mileage, with EPA highway estimates of 37, but I would bet in many cases the mileage would be almost identical. And if you’ve ever driven up the hills of Duluth, Minnesota, and realize what winter storms can be like, you might trade a couple mpg for the all-wheel drive quattro. My favorite feature might be the aforementioned nav screens. The normal center-stack screen does a good job, and can have its information screens altered easily by a console knob. Playing around with it, I found that you can have a flat map of streets and so forth, or you can switch it and come up with a Google Maps screen, which is from actual satellite photos, with building, street and tree detail. Impressive. And very neat. 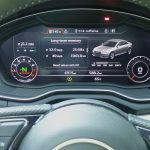 Meanwhile, the steering wheel is loaded with technology itself, and one of the features is that you can alter the look of the instrument panel, which starts with the normal large tachometer on the left and large speedometer on the right, with a panel between them for various items you select. One of those items is to duplicate the nav screen. Sure enough, you get the nav map between the tach and speedometer. But if you click it again, it goes to the Google Map real-life satellite view. 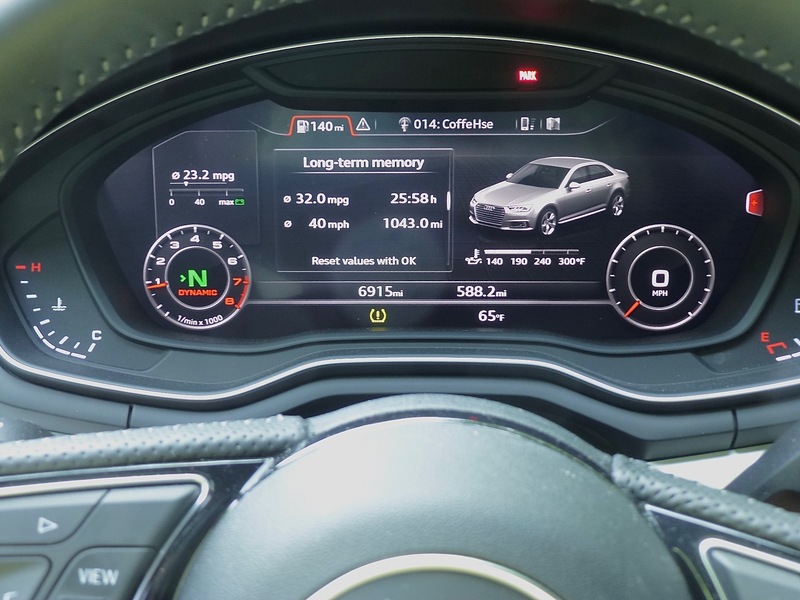 And if you click it still more, the large tach and speedometer shrink to about one-fourth their size, out on the extremities of the whole instrument panel, and the Google Map screen spans from left to right, a panoramic view of the area ahead of your car, only much clearer. Panoramic view shows home, neighborhood. Normal gauges can be reduced in size. Navigation can select Google Maps view. It is so amazing, I parked in my driveway and played with it for several minutes after getting to my rural home. 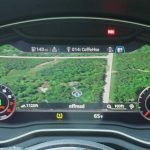 I enlarged the panoramic view of my location until it showed my position in my driveway’s turn-around area, as well as my house and garage and tree-lined driveway. I magnified it more until it felt like I was parachuting down into my property. Come to think of it, you can have your autonomous self-driving vehicle. 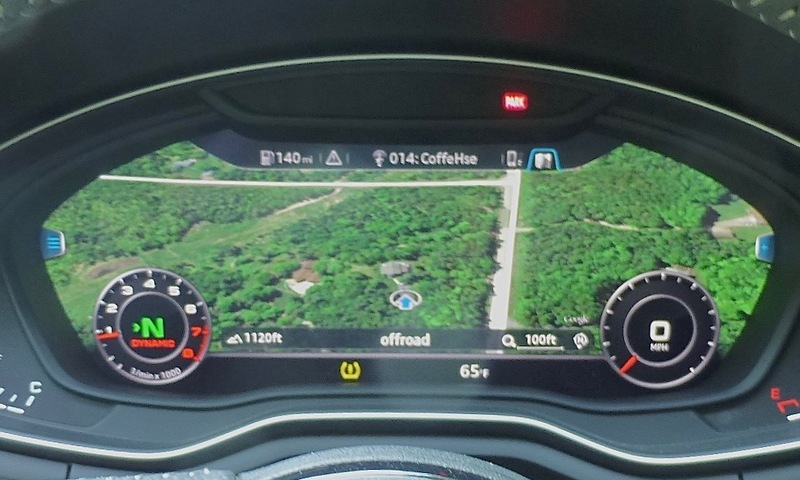 I’ll take the A4; I believe you could tape over the windshield and drive from here to Chicago by using only the nav screen on the instrument panel for your forward vision. By the way, I still believe I was right voting for the Audi A4 as Car of the Year back in 1994. Nobody can remember what actually won, but the A4 was the best and most enduring car of that year, and it is still among the best cars in the world.